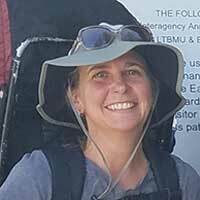 The Redwood Forest Foundation is pleased to announce that Karen Youngblood has joined our Usal Redwood Forest Company (URFC) as a Forest Conservation Specialist. Karen graduated from UC Santa Cruz with a B.A. degree in Environmental Studies in 1990 and received her M.S. from Humboldt State University in Natural Resources with an emphasis in Forestry in 2001. She has a distinguished career as a naturalist and field biologist. In the 90s she started as a park and interpretive aide in the old growth redwoods at Prairie Creek State Park. Her early interest in restoration ecology led her down the road to the Mattole River where she helped measure cross sections of pools and installed root wads to improve fish habitat with the Mattole Restoration Council. Soon thereafter, she was back up north snorkeling in the Smith River counting salmonids followed by walking lengths of the Chewacan River in southeast Oregon, habitat-typing for the forest service. After years of adventurous seasonal work, Karen returned to Humboldt State University to obtain a GIS certificate and Masters in Natural Resources. 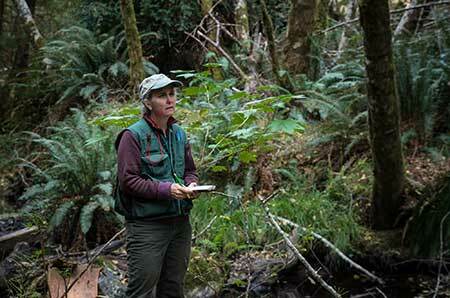 While at HSU, she did GIS work for Pacific Watershed Associates. After graduation, she headed back to the woods and spent several years traversing northern California forests gathering data on permanent forest plots used to analyze forest health. In 2007, Karen returned to the redwood forest region in Mendocino County to raise her son and has continued to work as a biologist, to conduct rare plant surveys, monitor coastal restoration projects, and manage natural resource spatial data. These assignments included a stint with the local Campbell Global office 2008 to 2015 where she worked closely with RFFI staff and became very familiar with our work. RFFI’s Mitzi Rider and Lin Barrett, who worked closely with her then, were thrilled to have Karen come on board. They describe her as a great team player who brings a solid understanding of our organization and outstanding GIS and graphic skills.